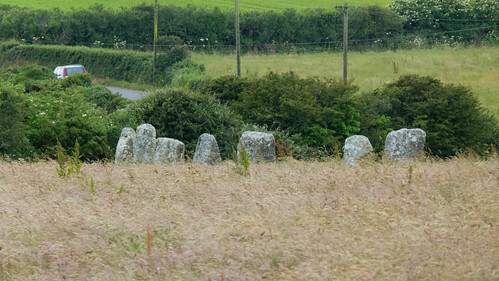 The Merry Maidens stone circle with the three nearby tall standing stones, the Fiddlers, are in what most be the most accessible of the many remaining prehistoric landscapes in the Penwith peninsula at the tip of Cornwall, being right by the main B-road from Penzance to Lands End. But it can still be a quiet area to visit. This series includes views not only of the circle itself, formed of low granite stones, and of the Fiddlers. 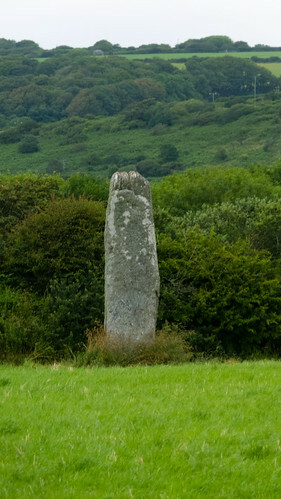 There is also another nearby tall standing stone, now incorporated into a field hedge. Although it is not marked as an antiquity on the OS map, it looks very much like one. So do two other stones, now used as the gateposts leading from the road to the farm nearest the circle. The set also includes pictures of the partially-open prehistoric chambered tomb, on the verge of the road a quarter mile or so from the circle.